I've been an SE participant for years, but only got actively involved with DIY in 2015. I'd have sworn that early on there was a flag/close option along the lines of "Not about home improvement". Am I nuts? Did I imagine that? None of those options make sense in the case of a completely off-topic post. What's the right course of action then? Are you talking about the "Blatantly off-topic" reason? That is shown to people without the close vote privilege who are flagging to close a question. There's no good reason to allow entering a custom message here though; they'll still require a person with close vote privileges to close them, and the reason should be obvious to anyone reviewing the flag. Since you have 3K rep here, you can now cast close votes, so you won't see this option any more. Instead, you're supposed to either choose one of the canned reasons, or select off-topic because... > Other... from the close dialog and add an explanation of what's wrong with the question. Not the answer you're looking for? 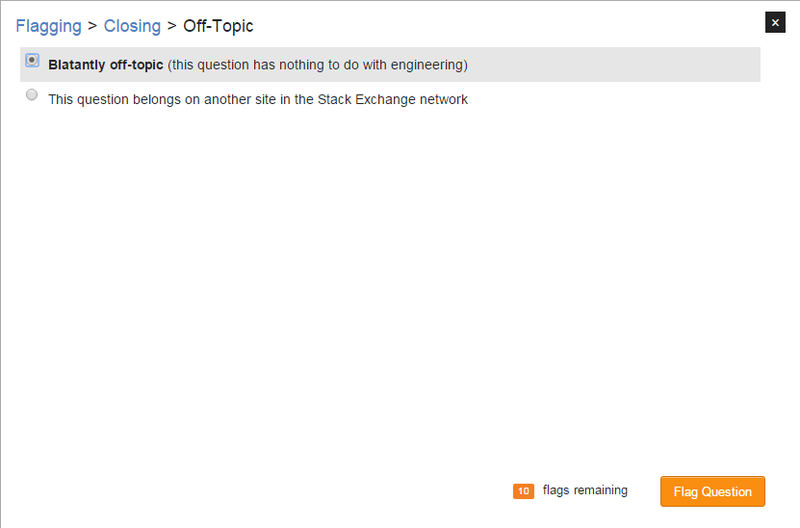 Browse other questions tagged support close-reasons vote-to-close . What should we do about duplicates that are better questions than the original?